In the previous article we offered a brief review of small Roman bronze antiquities. One group of objects making up a large proportion of small bronze antiquities available on the market is the fibula or brooch, an ornate pin, usually made of copper alloy but sometimes of precious metals, used to fasten clothing prior to buttons coming into common use. Because this is such a diverse and widely collected type we thought it best to review fibulae separately in this article. Fibulae had a long pre-Roman history throughout what would become the Roman Empire. Many Roman fibulae reflect earlier local traditions and styles. The example pictured below, from the Iberian Peninsula, dates to the transitional period when what is now Spain and Portugal were gradually falling under Roman control. The acorn shaped knob at the “foot” end is typical of pre Roman Iberian and Iberian-Celtic style. Otherwise, its form is typical of most Roman brooches in the western parts of the Empire: A coiled spring, at the end of which is a pin that rests in a catch plate, just like a modern safety pin. The bow of the brooch offers the manufacturer the opportunity to enhance the otherwise plain surface with gilding, silvering, tinning, enameling, punch marking, chip carving or any number of other decorative devices. While the great majority of Roman brooches are simple and undecorated bronze (see 1st Century European example directly below) some examples utilize the decorative schemes mentioned above. The brooch’s owner might have a “fancier” piece custom made by a local craftsman or have an ordinary example enhanced to look “upmarket” with a layer of tin (to make it look like silver) or of silver or even gold. The example pictured here, dating to the early 1st Century, is a case in point: a fairly straightforward brooch has been enhanced with a layer of gilding, much of it still remaining. Not all fibulae were sprung pin types based on a bow shape. Others were based on a round plate, sometimes with a central boss, while others were flat plates cast in a wide variety of forms, including animals and mythological creatures. 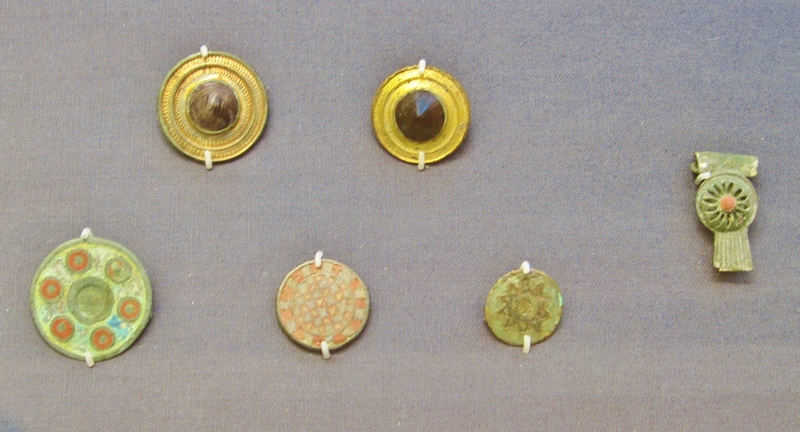 This group of six is on display in the Roman galleries of The British Museum, London, and illustrates the variety of decorative schemes used on circular brooches, including colored enamel, gilding, and the use of glass “gems” in the center. The group below is on display at the Verulamium Museum, at the site of Roman Verulamium, today’s St Albans, England. It includes typical bow brooches, most enhanced with cast or punched decoration, silvering and other techniques, as well as penannular types. 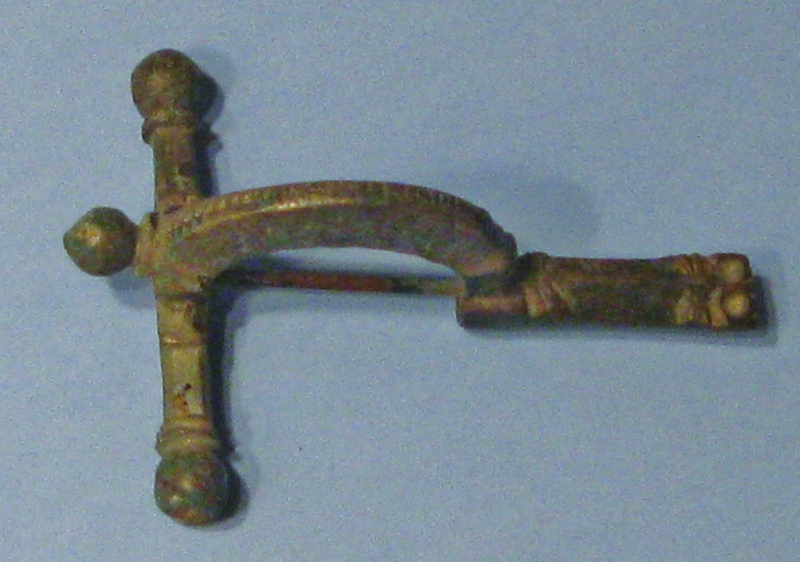 Fibula types evolved over time, of course, and during the late Roman period, between the end of the 3rd Century and end of the 5th, the most common type was the “crossbow” brooch, so named on account of its shape. Very elaborate examples in solid gold, solid silver, gilt or silvered bronze, often including decorative enhancements of niello (black silver sulfide) were given by Imperial officials to loyal officers and others worthy of honors. Many of these have been found in burials of the period. Still, most crossbow fibulae were of simple bronze with cast or punched decoration. The example below, one of several we’ve sold over the years, is typical. The late Roman crossbow type evolved into still more forms and with the arrival in both western and eastern Europe of many migrants from the east and north (the so-called Barbarians) new tastes in personal adornment were introduced. In some regions, Scotland for example, the use brooches continued well past the Medieval period, at least for decorative purposes. But new clothing styles suitable for a changed climate demanded the use of buttons and clasps, gradually phasing out the use of brooches. Justine Bayley & Sarnia Butcher, Roman Brooches in Britain: A Technological and Typological Study Based on the Richborough Collection, The Society of Antiquaries of London, 2004. Richard Hattatt, Ancient and Romano-British Brooches, Oxford, 1982.
http://finds.org.uk/ The UK’s Portable Antiquities Scheme finds database. One can do an advanced search, including only those objects with images, by date, type, find location, etc. While this only reflects UK finds, many “foreign” types of fibulae appear in the database, having arrived in Britain with army units, merchants, etc. A simple search for the term “brooch” with images brought back a staggering 24,679 records.